US uranium producer Energy Fuels had a fruitful Q2, reporting net income of US$7.1 million. It is positioning itself to restart vanadium recovery operations at its White Mesa mill. 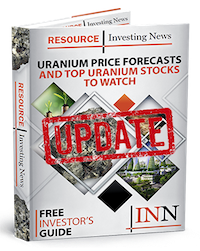 US uranium producer Energy Fuels (TSX:EFR,NYSEAMERICAN:UUUU) had a fruitful Q2, reporting US$26.9 million in total revenue and net income of US$7.1 million. Notably, the company also announced during the period that it is positioning itself to restart vanadium recovery operations at its Utah-based White Mesa mill this year. “As the only company currently capable of producing vanadium in North America, we are also very excited about our current vanadium opportunities,” Mark Chalmers, company CEO and president, said in a press release last Friday (August 3). Energy Fuels expects to recover roughly 500,000 pounds of V2O5 in late 2018 or early 2019, and is estimating production of approximately 4 million pounds of V2O5 over the life of the project. In terms of uranium, 128,000 pounds of U3O8 were recovered during the quarter on the company’s own account, plus an additional 91,000 pounds of U3O8 for the accounts of others. Energy Fuels delivered a total of 500,000 pounds of U3O8 at an average realized price of US$53.55 per pound. The last few months have also been eventful in others ways for Energy Fuels. In January, along with Ur-Energy (TSX:URE,NYSEAMERICAN:URG), another US uranium producer, the company filed a petition with the US Department of Commerce, asking it to look at the national security of uranium imports. In July, the department launched an investigation on the issue under Section 232 of the Trade Expansion Act of 1962. The companies would like the US to depend less on uranium imports, and rely more heavily on resources produced domestically. Energy Fuels’ share price was at C$4.41 on the TSX at close of day Tuesday (August 7). It has risen an impressive 82.23 percent year-to-date.